Journeymen ska act Streetlight Manifesto have gone through a great deal to get their upcoming album The Hands That Thieve out to their fans. Of course, a release that hard-won deserves a big support tour for it and the band is more than happy to oblige their fans! But this might be the last time they hit the road for a long time, if this doesn’t turn out to be their last tour jaunt, period. In a statement titled “The End of the Beginning Tour”, the band outlined their intent: to be able to put on at least one last strong tour showing, because after 2013, things are going to be changing for the group. Today, it’s time to announce to our fans and friends that we’re turning the last page of this particular chapter of our lives. We’ve solidified plans to tour our well-traveled asses off for one last year, until the end of 2013, at which time we will be not necessarily be moving on from the band, but changing our approach to what we do with the majority of our time. More specifically, we will no longer be touring year round, nor will we be touring much at all anymore. We have decided to step away from the table before we get sick of our favorite meal; we’ve seen enough bands over the years grow old playing the same songs for decades, going through the motions, slowly fading, and more depressingly, continuing on for all the wrong reasons. We’re moving on to preserve what we created, to be able to look back on it proudly, before we find ourselves looking around and realizing that we’ve become what we swore we’d never be. In the last few years, we’ve all hit the 30 year mark, and we’re ready to try some new things; some of us are ready to do a little bit of the ol’ settling down, some of us are excited to pursue different musical avenues, and some of us just want to live a slightly less hectic lifestyle. We’re doing this now for all of these reasons, not to mention 10 years is nice, neat chunk of time to devote oneself to something before moving on. Doing this next year, at 11 years wouldn’t be nearly as dramatic, nor as poetic. You can check out the full statement over here, but for those of you who need a TL;DR version, here it is; it doesn’t sound like the guys are breaking up, or going on hiatus necessarily, but it does sound like the group is ready to slow down a little bit. They might play live again after 2013, but the odds that they’ll play any of the stops on their The End of the Beginning Tour is pretty much nil. 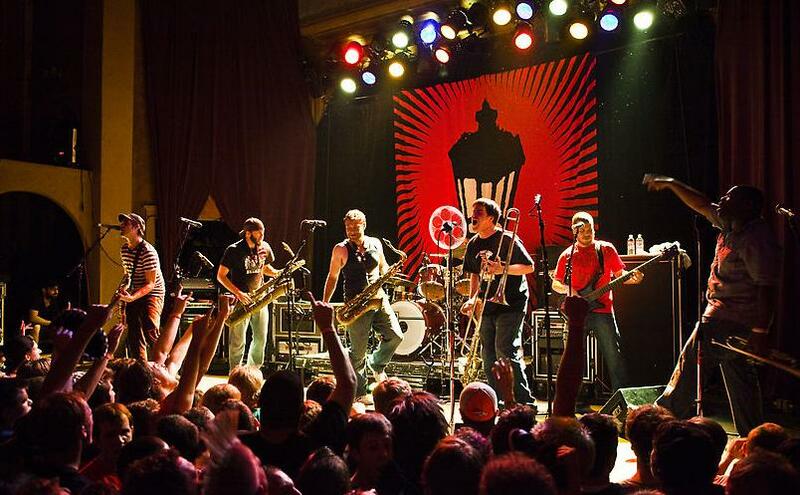 Check out Streetlight Manifesto’s tour dates and the sweet artwork commemorating the tour, below. You can pick up tickets on Streetlight Manifesto’s website.